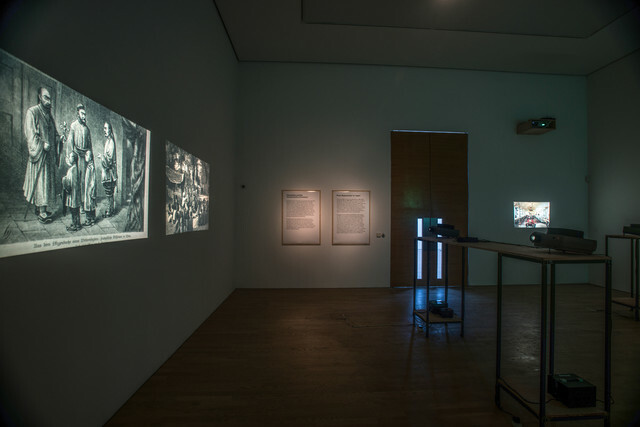 Kostas Prapoglou writes on Kader Attia’s moving image installation Dispossession (2013) currently on show at Middlesbrough Institute of Modern Art (MIMA). The work surveys through a series of interviews and slide projections the impact of colonialism and the effect of Catholic missionaries over the sub-Saharan regions and the luck of African treasures. Addressing issues of heritage, cultural identity, religious ethics and societal discourse, Attia inspects the construction of emerging new realities. Dispossession (2013), currently on show at Middlesbrough Institute of Modern Art (MIMA) until 8 October 2017, is a moving image installation by French born, Berlin and Algiers based artist Kader Attia. 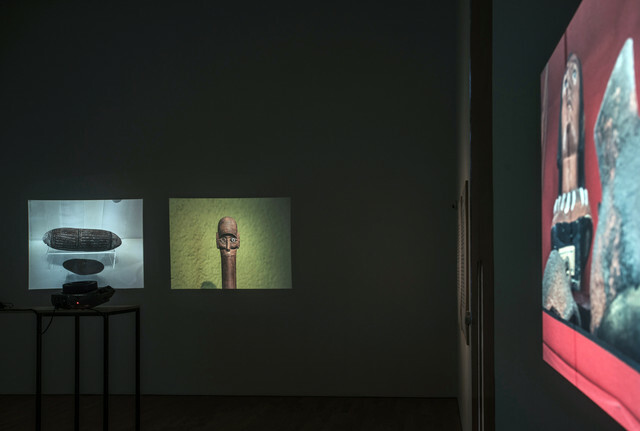 Comprising two slide projections and a video of interviews, the work was acquired through the Contemporary Art Society’s Collections Fund at Frieze in 2016 and was donated to MIMA. In this work, Attia surveys and brings forward an amalgamation of topical issues revolving around the obscure collection of African artefacts at the Vatican. These were amassed and are today stored away in the Vatican’s private collection while only a small portion is readily accessible to the public at the Ethnological Missionary Museum (Museo Missionario Etnologico). In certain parts of the world and as early as the sixteenth century, European colonialism generated a large number of missionaries who were sent to spread Christianity to the new territories, Africa amongst them. Missions operated by powerful religious orders and disciplines such as the Jesuits, Augustinians, Franciscans, Dominicans, and Evangelists reached sub-Saharan tribes and for centuries converted local populations into the monotheism of Christianity as opposed to previous practices of polytheism and paganism. The pantheon of African indigenous communities pays homage to numerous gods and deities while also placing emphasis on the special powers and spiritual essence of trees and plants, animals, rocks, rivers, lakes, and even weather phenomena. This animistic discourse has been profoundly expressed through artistic practice among African peoples, it encompasses the production of objects on an industrial scale, such as statues, masks, furniture and jewellery. Fetishism and totemism – two terms associated with man-made (wooden or metallic) objects charged with supernatural powers and energy – embody the significance of particular life events such as rituals and ceremonies relating to initiation, farming, birth, healing, marriage and death. Some 80,000 early objects are today in the Vatican. Thousands of others can be found in an array of museums, as well as private collections principally scattered across continental Europe. With ambiguous provenance and terms of ownership, many of these treasures remain locked away and unseen, removed not only from their place of origin and their rightful owners but also from scientists and researchers. Attia’s video brings together a series of interviews involving two anthropologists (Brigitte Derlon and Monique Jeudy-Ballini), the conservator of the Josephite College Museum of Melle in Belgium (Alfons Van den Eyden), an ex-missionary and conservator of the Congo Museum of Art, Geraardsbergen in Belgium (Jaak Geysels, also known as ‘Father Willibrord’), a lawyer at the Paris and New York Bar (Luc Saucier) and an art historian (Dr Uta Kornmeier). He investigates the meaning of these cultural artifacts through the prism of each of the interviewees and discusses with them those parameters that define or blur the boundaries of cultural and societal identity on a par with its construction or deconstruction. The slide projections complimenting Attia’s video present a rich index of objects currently on display at the Vatican’s Ethnological Museum and also an assortment of archival material such as texts, etchings and images from old books which provide visual historical references which complement the film-maker’s subject matter. We witness scenes from the everyday life of indigenous tribes, the role of missionaries, and the interaction and integration between them. Non-Western populations are portrayed as primitive and non-civilised, juxtaposed against a different image for the Europeans who are depicted as physically and mentally superior. Although much of contemporary Catholic missionary work has been the subject of major development, with key revisions and modifications following the Second Vatican Council of 1962–1965, a great deal of damage had already taken place long before that. Notions of cultural imperialism, in combination with the role of nationalism and its impact on the identity and distinctiveness of native tribes, are indirectly raised by Attia and his interviewees’ responses. The colonists’ religious polemic against extra-occidental counterparts had an immediate effect on the objects fabricated for religious practices. The artist’s attempt to discover whether these objects were only considered by missionaries as decorative or utilitarian, or seen as articles of spiritual superiority, discloses equivocal conclusions. Why were missionaries instructed to destroy religious artefacts in-situ while at the same time thousands were secretly sent to the Vatican? To what extent did priests succeed in suppressing and eradicating witchcraft practices at the beginning of colonialism, which inevitably re-appeared during the process of decolonisation and after several regions claimed their independence? The campaigns and huge efforts of Catholic Fathers and Sisters to detach local populations from their ancestral roots by launching a new religion that was totally foreign to them, not only in terms of context and practice, but also in terms of iconographical aesthetics, resulted in the transformation of communities or the unavoidable formation of hybrid religions. During their ongoing battle against indigenous faiths, missionaries convinced members of tribes that there was no need to continue the possession of symbols of paganism and therefore these were required to be destroyed, discarded and given or sent away, perhaps for ‘spiritual cleansing’ or even exorcism. It still remains unclear whether exorcisms were conducted by the Vatican clergy, a possibility that the two anthropologists do not hesitate to entertain in anthropological and theological terms. The establishment of schools, where all members of the local communities would be introduced to the new God, soon became the epicentre of catechism activity in every village. In many cases, some of these individuals would be accepted as clergy, an easier way to infiltrate the native population and lead by example. During their interview, Van Den Eynden and Geysels guide us through the Josephite College Museum collection and show us a series of ritual objects from the Kasai, Katanga and Kuba provinces in central Africa which ‘were given as gifts’ by the students of such schools. Many of these items would later appear in European museums and private collections. Back in 1925, Pope Pius XI (known as ‘Pope of the Missions’) organised a large-scale cultural exhibition inspired by missionary work in all parts of the world except from Europe. This could be regarded as an illustrious display of power showing the world the achievements of the Catholic Church, similar to the triumphant displays of booty of the conquered (spolia of war) during the era of the Roman Empire. More than 100,000 rare samples were sent by all missions and exhibited in twenty-four pavilions in the Vatican Gardens. Following the closing of the exhibition and its huge success, the Pope announced that most of the exhibits would be kept at the Vatican and become part of the new Ethnological Missionary Museum. [i] During her interview, Dr Kornmeier discussed the importance and the value of the cultural products of indigenous groups and how these increasingly became very popular and desirable items amongst anthropologists, scientists, academics and, of course, collectors, who did not hesitate to purchase them directly from missionaries or acquire them in exchange of generous donations. The repatriation of artefacts is a subject that Attia also explores in his installation. The problematic nature of this process, involving as it does the traceability of the artefact through the recorded – often false – documentation of such items can be an obstacle in returning them to their place of origin. Another sensitive issue is the destiny of sculptures that contain human remains, a common traditional practice within certain groups and closely linked to their history and ancestral roots. Their sale as simply ‘works of art’ raises ethical questions, yet this is still an unexplored ethical minefield, and needs to be further supported by international legislation in collaboration with art historians and other experts to implement the huge task of repatriation. In order to address the cultural theft perpetrated by the Catholic Church, lawyer Luc Saucier proposes an alternative solution – a form of repair – involving a percentage of the resale value of objects being awarded to ethnic groups who are regarded as the original owners of such artworks. Referencing the already existing practice of the Artist’s Resale Right (ARR), he highlights the royalty percentage from resale (normally between 3 and 7%) which could be given to communities in Africa and elsewhere in order to improve their quality of life. Attia’s installation highlights the dangers of cultural imperialism and economic exploitation hidden behind the facade of religious conversion, while also addressing pivotal concerns about social justice. The potential annihilation of social structure among the population of converts through the influx of new Christian ideas and beliefs, along with the theft, vandalisation and looting of its symbols and heritage, has proved ruinous and perhaps futile in the long run. Despite the cultural and physical enslavement of African tribes, their deeply rooted identity survived through centuries of incessant struggle and still thrives, especially in more remote and isolated parts of the continent. It has been argued that colonialism and religious conversion of Indigenous populations have assisted a great deal with the social services sector and the health care system, bringing a better quality of life. It is also said that where missionary Sisters were involved, the role of women in society was advanced in what was previously a strictly patriarchal society. Finally, many of the clergy succeeded in recording and documenting languages with their idioms and local dialects which became an essential tool for linguists, sociologists and historians. Despite all the above, the truth is that we shall never be able to precisely assess what would have been the progress of these communities had they been left alone and untampered by oppressive Western intervention. Dispossession (2013) is a thought provoking piece that takes its viewers on a journey beyond the borders of conceivable realities, raising philosophical questions, while scratching the surface of the truth that may lie beneath. The underlying commentary involving the hypostasis of precious works of art, challenges moral and ethical codes of conduct as well as religious laws; perhaps unexpectedly confrontational for some. It is a strong historical and ethnological reference for autochthonous races who are still subjected to ‘postcolonial’ economic, political and social oppression, and yet who continue to fight for their autonomy and the upkeep of their social identity and uniqueness. Kostas Prapoglou is an archaeologist-architect, contemporary art critic and curator based in London and Athens. He has a doctorate in Roman Architecture and writes for numerous publications and online platforms including OCULA, Aesthetica and THE SEEN: International Journal for Modern and Contemporary Art (Chicago). His texts have been featured by various galleries such as Marian Goodman and Hauser & Wirth. His latest curatorial projects include Latitudes | Humanscapes an exhibition for the city of Eleusis’ (Greece) official bid for the title of European Cultural Capital 2021, Zoomorphism | Reimagining Personal Mythologies for Maison Hermès, Athens and Trails of Memories for Paphos (Cyprus) European Cultural Capital 2017. 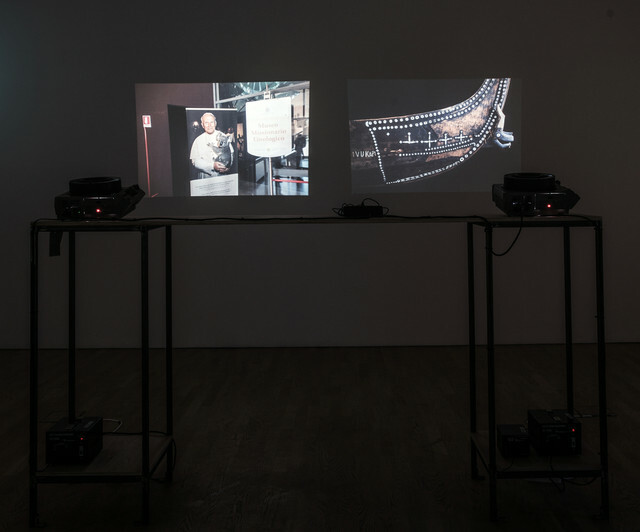 He has developed a keen interest in notions of transnational and transhistorical realities and his curatorial practice investigates the ongoing discourse of sociopolitical parameters that are embedded in continuously emerging paradigms of ancient and contemporary cross-cultural narratives.